You know how the morning goes...you're running around like an idiot, spilling your coffee all over yourself, trying not to forget anything, and hoping that you don't walk out the door without eating breakfast. And then, once you get in the car and think you've been successful, you realize that while you were thinking about breakfast, you completely forgot to bring a lunch! Here's a quick and easy lunch for mornings like that. Of course, this was inspired when I was running a little late for school the other morning. (I usually need to allow an extra ten minutes for the 5 trips that I have to make taking my books for the day to my car before I leave). ♡ Total Cook Time: 5 minutes (if you already have cooked rice). 1. Lay the tortilla out on a plate. Add spinach, rice, tomato, and mushroom. 2. Add whatever dressing you like, and sprinkle with salt and pepper. 3. Wrap up. (This is where you must be diligent, it could take an extra 5 minutes if everything falls out because you weren't careful wrapping it). ♡ If you don't have cooked rice and are short on time, substitute 1/2 cup canned chickpeas for the rice. 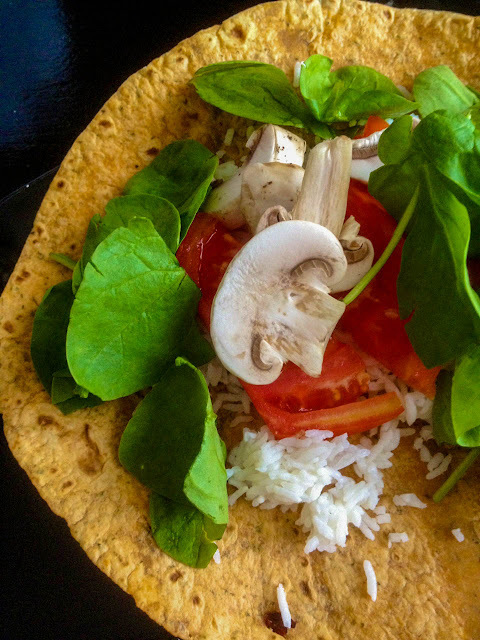 ♡ Add beans to this wrap for protein. ♡ Add fresh herbs: basil, parsley, or oregano if you want. ♡ If you don't have these ingredient, use whatever veggies or grains that you have in the fridge.